Culture management is a method of management that can more effectively create synergy effect with creative ideas on cultural contents and business skills. It can contribute to sustainable growth, employment and added value. Recognizing the importance, The Herald Group started to find and reward those who made contributions in relation to culture management through the Korea Culture Management Awards from 2006. 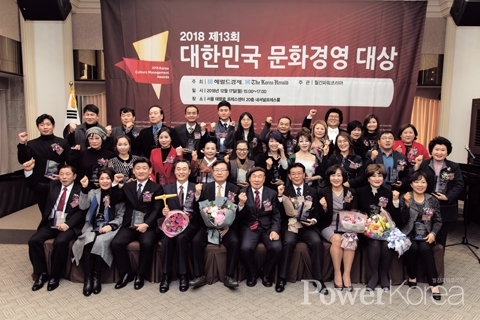 Hosted by the Herald Group and managed by monthly <Power Korea>, the awards last year were held at Press Center Seoul on December 17. Announcer Aram Jeong opened the awards followed a congratulatory speech of The Herald Group CEO Gwon Chung-won and the head judge of the screening Kim Gwang-gyu. The congratulatory performances were staged by baritone Yang Tae-gap, soprano Kim Hyun-jung and Korean opera singer Kang So-bin. Yang has played a number of main roles in The Magic Flute, L'elisir d'amore, Rigoletto, Don Giovanni, The Tales of Hoffmann, The Marriage of Figaro and La boheme; he currently is serving as CEO and music director of T.G.Y Art Company. Kim studied at Kassel Music College, Germany, and founded Gyeonggi Opera Company when back in Korea. Kang is the president of the Jeju Arirang Preservation Society and passionately sang Arirang Fantasy on the day. The congratulatory performances were followed by speeches by the Cheonan Foundation for Arts and Culture, Kookhak Kigong Association, and Senior Venture Association who also won the awards. Some of the notable winners also were the Korean Folk Village, Lotte World, GS Retail, Dongwon F&B, Hyunjin Steel and Bella Vita Convention.